To the Ethiopian government, however, Gerba was a terrorist. Four days after the meeting, he was arrested. In November 2012 Gerba was convicted and imprisoned under Ethiopia’s 2009Anti-Terrorism Proclamation for association with the banned Oromo Liberation Front (OLF), which the government has asserted is linked with al-Qaeda affiliated entities. According to organisations like Amnesty International and Human Rights Watch, however,Gerba was guilty of being Oromo and talking of the plight of his people. 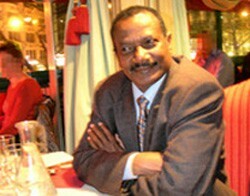 Shortly before hisarrest, Gerba had described the challenges facing his community, telling Voice of America “Anyone who speaks the [Oromo] language and does not belong to the ruling party is a suspect and can be taken to prison any time.” Gerba and other incarcerated Oromo (Oromo rights groups estimate there are around 20,000 Oromo political prisoners in Ethiopia) continue to spark protests in Ethiopia and across the global Oromo diaspora. Yet the nation’s new rulers, based in the Christian Tigray people, who also considered themselves ethnic successors to Aksum, continued the center’s policy toward the Oromo. 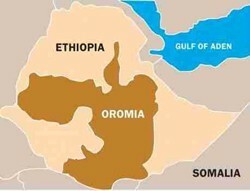 From 1992 to 1994, for example, as many as 50,000 Oromo suspected of ties with the OLF were imprisoned in four concentration camps and 3,000 died. Additionally, it is estimated that between 1992 and 2001 50,000 Oromo were killed and 16,000 “disappeared,“ a euphemism for secret killing. During the 1998-2000 war with Eritrea, Oromo were drafted to fight and died in large numbers, making up the majority of the more than 100,000 Ethiopian soldiers killed. The September 11 attacks brought increased American involvement in the Horn of Africa and an alliance with Ethiopia against “terrorism“. In late 2006 the US, which had begun training the Ethiopian army three years earlier, backed Ethiopia’s invasion of neighbouring Somalia. Ethiopia sought to firmly align its domestic opponents with the US war against al-Qaeda, with Ethiopia’s intelligence chief, in documents released by Wikileaks, telling the US ambassador in 2009 that the OLF is an accomplice of “international terrorist groups” and receives “support and assistance” from terrorist enemies of the US. Ethiopia joined a regional “rendition” network, with US agents interrogating terror suspects in Ethiopian prisons. Ethiopia’s lack of democratic transparency was not a barrier to US aid, with the country receiving over $2bn in the two years following national elections in 2010 that saw the ruling party win 99.6 per cent of parliamentary seats. In August 2011 the BBC reported that the government was using billions of dollars of such foreign aid to systematically starve populations in the country’s south and employing tactics of “mass detentions…torture and extra-judicial killings.“ Two months after the report aired, it was revealed that the US was flying drone missions from its base in Arba Minch in southern Ethiopia, just adjacent to the Oromia region. The August 2012 appointment of Hailemariam Desalegn, a Christian of the southern Wolayta people, as Prime Minister following the death of Zenawi led to hopes of greater democracy and inclusion. Yet the government structure and mentality seems to have remained in place. In February 2013, for example, state television aired a documentary co-produced by the National Security Agency and Federal Police entitledJihadawi Harekat or “jihadi movement” which accused the protesting Ethiopian Muslims of links with foreign terrorists.